Losing weight and eating delicious foods, including appetizers, is possible. In fact, the more satisfied you are with your food selections chances are you will eat within moderate portions. The key to weight management, whether maintaining weight or losing weight, is to choose recipes that are low calorie. Selecting low fat recipes is important since one gram of fat contains nine calories. 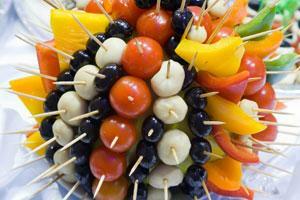 Certain appetizers are known to be high in calories and grams of fat. However, the following recipes can replace the not-so-healthy appetizers and offer taste, satisfaction and less fat. Stir together ricotta, cream cheese, radish, chives, herbs and onion salt. Mix well. Cut the tops off of tomatoes. Using a small spoon, scoop out and discard pulp. Let tomatoes drain upside down on a paper towel. Cut squash in half lengthwise; scoop out pulp and let drain as with tomatoes. Stuff vegetables with cheese filling. Serve immediately or chill until serving time. In large nonstick skillet, cook peppers and onion in 1 tsp. of the oil for 5 minutes. Stir in cumin and chili powder; cook for 1 minute. Stir in cilantro; set aside. Spread cream cheese over half of 1 side of each tortilla. Top with peppers and onions. Fold tortilla in half, pressing gently. Repeat with remaining tortillas. Place tortillas on ungreased baking sheet. Brush each tortilla with remaining oil. Bake for 5 minutes. Cut each quesadilla into 4 wedges. Serve warm with salsa.